1- Bold coaches reaping rewards: National team coaches ready to take a risk on raw, emerging talent are reaping rewards during the Euro 2020 qualifiers. 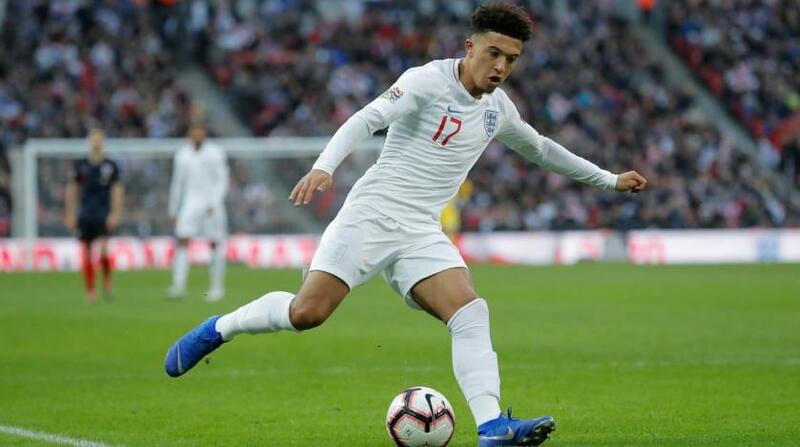 England boss Gareth Southgate’s gamble of starting 18-year-old starlet Jadon Sancho paid off when he created the opening goal and illuminated the game against Czech Republic with his fearless approach. Italy’s Roberto Mancini matched his Three Lions counterpart by starting teenager Moise Kean. The Juventus striker didn’t let him down as he netted Azzuri’s second in their 2-0 victory over Finland. 2- Style or substance for La Roja? : Following their failure to reach the European Nations Championship final, Spain’s rebuilding under Luis Enrique got a major shot in the arm when they overcame Norway 2-1 with a late Sergio Ramos penalty. But La Roja were very nearly undone by overemphasis on style over substance. Instead of killing off the game in Valencia, they spent more time showing off and very nearly paid the price. Enrique must train his side to develop a ruthless streak lest they get stuck in a rut. 3- Sancho excites because he takes risks: Though he lost possession once too often Jadon Sancho had England fans excited because he was willing to take risks. That’s the benefit of being nurtured in the German Bundesliga where young players are encouraged to express themselves unlike in the Premier League where talent is suffocated by fear to lose possession. EPL managers ought to pick a leaf from boss Gareth Southgate’s decision to offer Sancho leeway to take risks in order to create. 4- Laporte deserves Les Bleus call up: Struggling to comprehend criteria Didier Deschamps uses to select French national team. While I was delighted on loan Chelsea defender Kurt Zouma has returned to the Les Bleus fold, there is absolutely no way he should be considered ahead of Manchester City’s Aymeric Laporte. The Citizen has been second only to Liverpool’s Virgil van Dirk in consistency stakes. Laporte is even doing better than Pressnel Kimpembe and Samuel Umtiti, who has only returned from injury. Deschamps must give Laporte his chance. 5- Current Sweden better than World Cup side: Was very impressed by the level at which Sweden operated in their 2-1 victory over belligerent Romania. Though the Scandinavians reached the last eight at last year’s World Cup, their build up play was slow, turgid and almost devoid of imagination, hence the frequent 1-0 score lines. On Saturday, the front three of Marcus Berg, Robin Quaison and Emil Forsberg played with zip, zest and urgency as they subdued a very physical Romania side. Wouldn’t be surprised if Sweden upstages Norway in Tuesday’s Euro 2020 qualifier.